We will be selling our soap, Salt Scrubs, Sugar Scrubs, bath bombs, Honey Body Butter, and other bath products (with Easter theme) and will have our farm animal chalk boards, and local art/photography. Our eggs are free range, pasture raised, and from all different breeds of chickens. You see, we believe that the chickens born from generations on the ranch have been naturally selected from the strongest chickens. 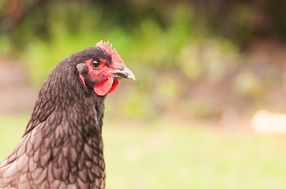 We do not believe that one breed of chicken is best - we like the "mutt" of chickens - those that survived year after year, strong foragers, disease tolerant, heat and cold resistant, and from hens that were allowed to have their baby chicks here. No genetically altered chickens, no antibiotics, no large order feed store/hatchery chicks that have been vaccinated because they were bred from a chicken mill (like puppy mills) so no false advertising. ALSO we are a registered valid business and with a registered valid egg producer and handler certified! Beware of those selling backyard eggs (on Social Media) and without a business license! 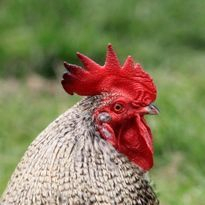 Beware of those ranches that have slow egg production - their chickens may not have been so hardy or come from breeders in the Midwest that only care about how many they can sell to feed stores.. These chickens (chicks) are marketed so that they produce max # eggs in 2 years and then die. Customers that buy from these places keep the inhumane treatment of these "chicken mills" in business. WE CARE ABOUT OUR CHICKS! The Loose Rooster Ranch takes credit card payments through Square, Paypal (looseroosterranch@gmail.com) and I also take Venmo! Please look for me on venmo, or scan. 2019 - BEE LIVES MATTER PROGRAM - honey harvesting the hives that are ready! Did you ever want to work with bees? Get your own honey? Learn more and help the environment? Learn more about beekeeping and how to SPONSOR YOUR OWN HIVE (click) for more info! If you cannot have a hive on your property - you can on ours! Join our program. A full hive sponsorship is $225/$250 AND if you can't do a full hive - join a GROUP hive. $10 for drone sponsor, $25 for worker bee sponsor, and $50 for a queen bee sponsor. I'll paint your name(s) on the hive box and you can participate in all the same activities live or from afar! Click on the link above to learn more. We have quite a few handmade items for sale now! Please consider shopping locally and supporting local farms and crafters. Newly created farm animal chalk boards, drink caddy's from reclaimed barnwood, Animal soaps, and natural soaps - all hand made with items from the Ranch. Check back for pics. FaceBook @looseroost. Winter hours - We will be open as the weather permits. By appt - please call us at 925-308-7126 for orders of honey, Honeycomb, bee pollen, and eggs for pick up during the week. Please give us 24 hour notice. Text or call us first - Convenient drive through - just pull in the driveway at the barn or main entrance - off street parking! All natural Honey & Beeswax lip balms! Made from our harvested beeswax from our Loose Rooster Ranch hives, and our delicious honey - we now have "lip service". We different types of classes. All available to sign up and pay on Eventbrite. Soap making Easy, which is open to 10 and over, and a cold process soap making class open to 18 and over. SOAP MAKING CLASS (EASY) for adults and children (over 10 years old)- Did you every want to learn a fun way to create ready to use soaps? This is a fun class that is guaranteed to have you loving what you bring home! Come make sheep, chickens, owls, horses, goats, mermaids, and more! Pick scents like Vanilla, Cherry, peppermint, Orange and more! pick your colors or learn techniques for making multicolored soap. All soap is goats milk melt and pour soap base we call HOTPOUR. non toxic and fun! Did you every want to learn the traditional way soap is really made? Let Kate and Cindy show you how to make them! This is the hands on old fashioned way to make soap. We will use the saponification process, using all natural and some organic ingredients. You'll go home with three different kinds of naturally made soap and the recipes to re-create them...or we will have come for purchase. You can always join another class to come practice! This is a fun class that is guaranteed to have you loving what you bring home! * You must sign up using Eventbrite links. Space is limited and so there will be no payments take at the door. The fee covers the ingredients and materials, time, venue and instruction. You must cancel 24 hours in advance. Thank you ! We had a great time ! Handmade products include lotion bars, Body mousse, natural soaps, beeswax candles, crocheted face/body 'scrubbies', drink caddies, farm animal chalk boards, and more! We also use reclaimed/repurposed wood to create unique hand crafted pieces. We have jewelry made from real Mustang horse hair (since we do own 3 gentled, once wild, registered Mustangs) - we are creating and adding things everyday, so check back! Some of our home made products include pure beeswax candles and various items made from old barn wood and other things found around the property. Do you know who your beekeepers are? Where that honey came from? I can show you the hive it came from! Farm fresh eggs, green/brown/white/buff color, medium/large sized. NEW LOGO (above) which we now have t-shirts, bags, stickers and hats! All year we plant: Flowers for the bees and edible for us; lavender, rosemary, sage, savia, sunflowers, catnip and for us as well, oregano, basil, nasturtium. The cool thing is that you get to meet us, your beekeepers in person AND we can point to the hives and show you exactly where the honey came from. It's not a "blend" of hives - each bottle is from one of the hives we have in the front of the ranch! The Apiary (hives) that we own are strictly for honey production and local pollination - not commercial and they stay on the property year round. We have names for each hive: The Honey Hen, Angry Rooster, and Disco Bay Gold. We also have sponsored hives that have their sponsors names, which they bottle for themselves. Today we have about 60 commercial hives in the back acres of the property. These are owned by a pollinator beekeeper that provides pollination to the local farmers. We help store these hives in the winter, and then they go to pollinate almonds, cherry and fruit orchards around the area in the Spring.